Outfielder Connor Panas will be heading to Australia this winter to build off his breakout season. Panas, who hit .276/.364/.475 with 20 doubles, three triples, and 18 home runs in 402 at-bats with high-A Dunedin; hopes to find similar success down under. His extra playing time should help Panas prepare for the next jump in his professional career. His experience in Australia will hopefully give Panas a better idea of what it’s like facing higher level competition. With many players with double-A, and triple-A service time, it should serve as a measuring stick for Panas. Another benefit for Panas will be more innings in the outfield. After converting from third base to the outfield between college and professional baseball; Panas is continually looking to sharpen his skills at his new position. That hard work showed in 2017, as Panas logged a career high 749 1/3 innings in the outfield. He committed just four errors, and maintained a .977 fielding percentage in his increased workload. 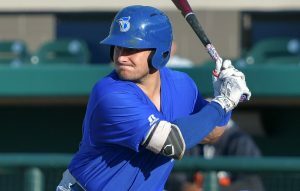 With all the success Connor Panas found in Dunedin this season, fans of the Toronto Blue Jays will want to follow his development in Australia this winter and for years to come.